Doppelganger – rehearsing a Dance Performance about relations between Humans and Humanoids. – H.A.U.S. Doppelganger – rehearsing a Dance Performance about relations between Humans and Humanoids. The play focuses on the notions of the production and the negotiation of cultural space between human and humanoid under mutually entangled influence. The format of the performance will be challenged as a research method that would elude the grasp of other formats. It is introduced to examine crucial aspects of intimate and private spaces such as presence, the continuous, the ephemeral, the temporal, the spontaneous and the atmospheric. The aim is to probe cultural space as the abyss of mutual resonance and reflection in endless production and negotiation processes. This should enable us to get a better understanding of the empowerment of users towards embodied A.I. Intelligent technology is about to change cultural spaces established since generations. Most prominently among the various new technologies are humanoid robots. Supposed to be functional in assistance and care, they enter private and intimate spaces of humans. Which cultural changes of those spaces should we pursue? What kind and what quality of relationship can we have with them – in contrast and in addition to our relationships with other humans, machines, animals, plants and objects? 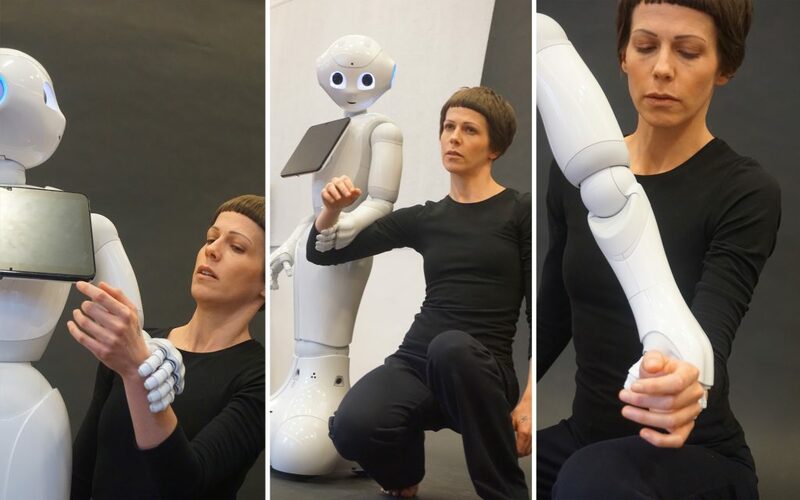 Contemporary dancer Eva-Maria Kraft rehearsing the piece “Doppelganger” with humanoid Robot Pepper by Softbank Japan.